Are you the owner of a brick-and-mortar Modesto resume service that's not listed here? Want to be? Just contact us and let us know! 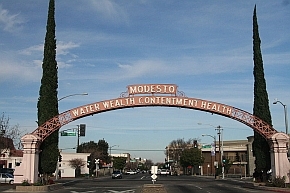 Modesto is a California town of two hundred thousand residents who enjoy a strong agricultural industry, manufacturing jobs and a thriving cultural scene. The city is surrounded by fertile farmland and the surrounding county is one of the most productive in the state in terms of agriculture. Residents enjoy easy access to fresh farms and vegetables at weekly farmers markets. Agriculture-related jobs are big employers. The country’s largest winery employs more than three thousand, while farms and food manufactures employ nearly seven thousand people in the city. Other important employers are the town’s government, schools and medical facilities. A new Center for the Arts and Downtown Plaza have revitalized the downtown area, leading to local music festivals like X-Fest, which draws more than 15,000 partiers to the city. The classic film American Graffiti was filmed in Modesto, and every year thousands of tourists enjoy the Graffiti Summer festival while residents admire the hundreds of classic cars that come to town. Like American Graffiti, Modesto captures a simpler time. You won’t find skyscrapers or subways here, but you will find fresh food, family events and good jobs.